An article published Feb. 6, 2018 in the Journal of the American Medical Association reported that researchers from the National Institute for Occupational Safety and Health had identified 416 cases of advanced black lung disease among coal miners in central Appalachia. New cases of black lung had been rare until recently, but this study suggests that the incidence is rising. Editor’s note: An article published Feb. 6, 2018 in the Journal of the American Medical Association reported that researchers from the National Institute for Occupational Safety and Health had identified 416 cases of advanced black lung disease among coal miners in central Appalachia. New cases of black lung had been rare until recently, but this study suggests that the incidence is rising. 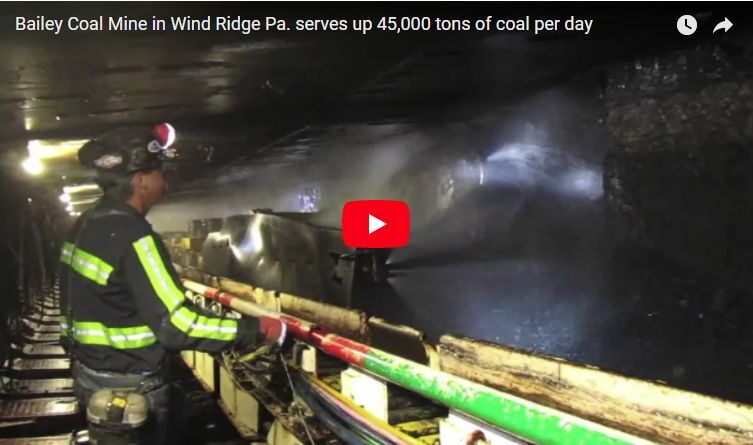 Anna Allen and Carl Werntz, professors of occupational medicine at West Virginia University who treat miners with black lung, explain what causes this disabling disease. What is black lung disease, and what causes it? Underground mining is one of the most dangerous occupations in the United States. Risks include inhaling toxic gases, such as methane, carbon monoxide and hydrogen sulfide; being crushed by roof falls or mining equipment; drowning when tunnels fill with water; and injury in fires and explosions. Even if miners survive the workplace, they may suffocate to death years later. Surface and underground mining is associated with two pneumoconioses, or dust diseases of the lung. Black lung disease, also known as coal workers’ pneumoconiosis, comes from inhaling coal mine dust. The other disease, silicosis, is caused by inhaling silica dust from crushed rocks. Black lung and silicosis often appear together because coal seams are found between rock layers that contain silica. When miners inhale dust, it deposits along their airways. Their bodies try to remove the dust by sending in special white blood cells called macrophages to engulf and chemically digest it. But the cells are unable to break down the dust, so they die and release enzymes that damage lung tissue. This causes problems that include chronic bronchitis, emphysema and fibrosis (scarring). 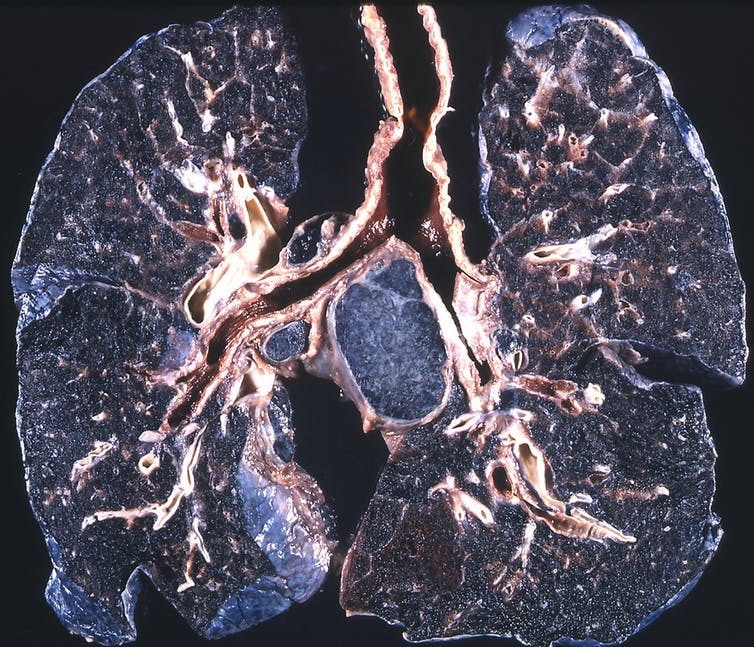 In progressive massive fibrosis, the most severe version of black lung, scarring causes lung volume to shrink, further damaging adjacent lung tissue and making air exchange even worse. Miners typically work 10 to 12 hours a day and up to seven days a week. This increases their exposure time and decreases the recovery time their bodies need to heal damage from silica and coal dust particles. Traditionally, black lung was associated with miners who had been working for at least 20 years, with symptoms often appearing after retirement. 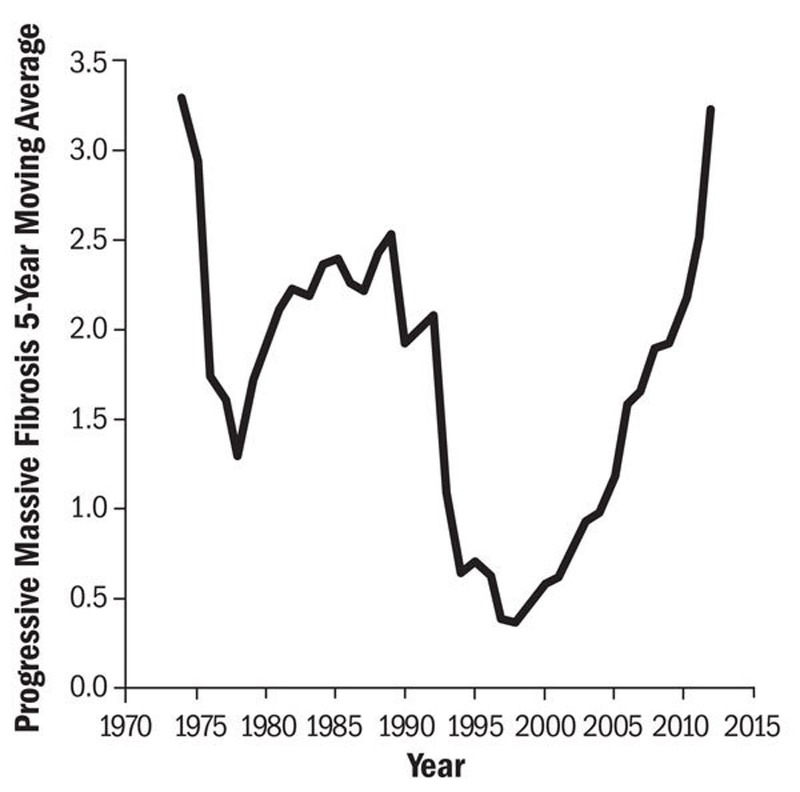 The recent trend is that black lung, including progressive massive fibrosis, is occurring after a shorter time in mining – as little as five years mining underground. Are you surprised by the large case cluster described in the JAMA article? The “hot spot” described in the JAMA study is in parts of western Virginia, southern West Virginia and eastern Kentucky. This area includes three of the federal Mine Safety and Health Administration enforcement districts – areas where the agency inspects coal mines and investigates accidents and complaints from miners. We see patients in Morgantown in north-central West Virginia and Cabin Creek in south-central West Virginia. We have noticed increased severity of disease in patients in the southern part of the state. During our first year, from June 2016 to May 2017, working in Cabin Creek providing federally authorized black lung exams, the incidence was 16 percent for black lung and about 6 percent for progressive massive fibrosis. In contrast, the same exams in our Morgantown clinic found black lung in less than 3 percent of cases, and only a few progressive massive fibrosis cases in four years. What do you think could be causing more cases of black lung disease? The increase is likely the result of several factors. Much of the coal in the area of the JAMA study is so-called “low coal,” with seams that are only 20 to 36 inches high. This “low coal” is hard to mine but profitable because it is metallurgical coal, which has high value for steel production. Manufacturers stopped producing shorter machines designed for mining “low coal” in about 1990 due to quality control problems. Now mines use taller machines designed for seams that are 32 to 36 inches high. As these machines cut coal from the seam, they must remove at least 12 to 16 inches of sandstone adjacent to the coal. Cutting that much sandstone significantly increases miners’ exposure to silica dust from the crushed rock. Newer machines also cut through coal and rock much more quickly than older models, generating more dust. Generally, what we call black lung is primarily silicosis in a coal miner, so silica exposure is significant to the development and progression of disease. In this video a longwall mining machine can be seen spraying water to control dust. Working in “low coal” also involves more physical effort than mining “high coal.” Crawling and stooping while carrying mining gear and operating equipment requires more physical effort. Miners breathe more heavily and frequently, which can increase dust exposure. And it is hard to keep air flowing smoothly through these smaller mines, so dust concentrations may be higher in some spots. What does the coal industry do to prevent black lung? 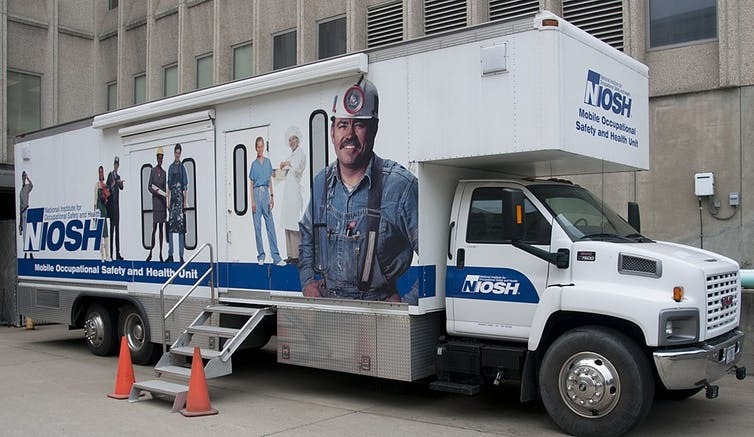 Screening is available to current miners through the federal government’s Coal Workers’ Health Surveillance Program, which uses x-rays to detect early changes in the lungs. This information is shared with miners so they can decide whether to continue working in coal mining, but is kept private from their employers. The main way to prevent black lung is to keep miners from inhaling dust. After 20 years of debate, recent changes in federal law decreased the allowed exposure from 2.0 milligrams per cubic meter of air to 1.5 milligrams. Continuous personal dust sampling has also been implemented so that miners can have real-time data on their exposures. This information is then used to determine whether a mine requires more frequent inspections. To decrease dust exposure, mine operators can spray water to knock dust out of the air, increase air flow in tunnels to move dust out more quickly, or require miners to wear respirators. What resources are available for miners who may have black lung? Black lung diagnosis can be complicated. Some of the most common symptoms include shortness of breath, decreased exercise tolerance, chronic cough, coughing up phlegm and inability to breathe lying flat. Other diseases can cause similar symptoms, so it is important for miners to talk to their primary care doctors. Some states have workers compensation programs that offer benefits to workers diagnosed with black lung. The Federal Black Lung Program provides medical coverage for eligible miners with lung diseases related to pneumoconiosis, along with benefits for those who are totally disabled by it, and for families of miners who die of black lung disease. There is no cure for black lung disease – we can only treat symptoms. Medications, such as inhaled steroids, can help patients breathe more easily. More severe cases can require oxygen and possibly lung transplants. One step patients can take is to stop smoking, which also destroys lung tissue. Smoking does not cause black lung, but it can make the symptoms more severe. Anna Allen, MD, MPH, is the Associate Residency Director of West Virginia University Occupational Medicine, which is funded by NIOSH. She is currently working on a NIOSH funded project assessing PAPR usage in the healthcare setting. She is also on the board of the Association of Occupational and Environmental Clinics, which has advocated for worker safety and health. All opinions expressed in this article are the author's and should not be attributed to WVU or other affiliated organizations. Carl Werntz is a part-time employee of the National Institutes for Occupational Safety and Health, although he has not been involved with any of the research mentioned in this article. The findings and conclusions in this report are those of the author(s) and do not represent the official position of the National Institute for Occupational Safety and Health, Centers for Disease Control and Prevention.